Acting and stagecraft of high order. Plus imaginative costumes, creative use of props, good singing…all in all, Perch-rafiki co-production Ms. Meena is a must-see. On 23d July, BBMP commissioned the fencing of around 15 acres of Byrasandra lake land in Jayanagar that was wrongly ‘sold’ in 2005 by a bank for debt recovery. Some encroachments are yet to be removed. Buses, lorries, cars, all parked on the roadside, causing jams. Jayanagar General Hospital, one of the biggest but most underused hospitals in the city, is to be rejuvenated soon. A slew of changes including more junior doctors and hospital management systems have been proposed. Mindless waste of tax payer money, helps boost GDP. Take the case of the drain cleaning works currently on from Sanjayanagar to Jayanagar. Two weeks into a major initiative, Bangalore’s major taxi firms have paid fines in the tune of lakhs of rupees, says Traffic Police Commissioner Praveen Sood. He talks about this and a range of issues in this exclusive interview. The opening of the Whitefield Railway overbridge has come a huge relief to motorists. But the bridge has already witnessed several accidents within days. Here’s the latest. They are the ones who go out in a majority on election day and vote. But very little has been done for Bengaluru’s poor. Second in a series of two articles, Citizen Matters gets down to brass tracks. A short film on one of Malleswaram’s Sampige Road. Listen to memories and rare stories on the history of this prominent road. 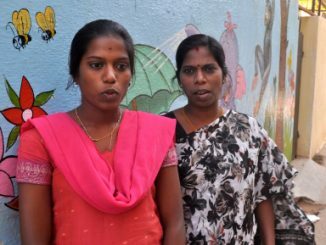 Despite a difficult background, many youngsters from the city’s low-income neighbourhoods are fighting their way out of poverty to get an education and make a life for themselves. Meet Gayathri, Chinnaya and Sangeetha. Shaurya Saluja, a Bellandur area resident is organising a Squash workshop, to be conducted by Satinder Bajwa, Harvard University Head Squash Coach, with proceeds going to a Squash academy that coaches rural children. If you get us some apples, we will go to school, otherwise, no!, said the girl.